Brand Loyalty. It's hard to put a price on it. Hard at least, if you're a consumer. 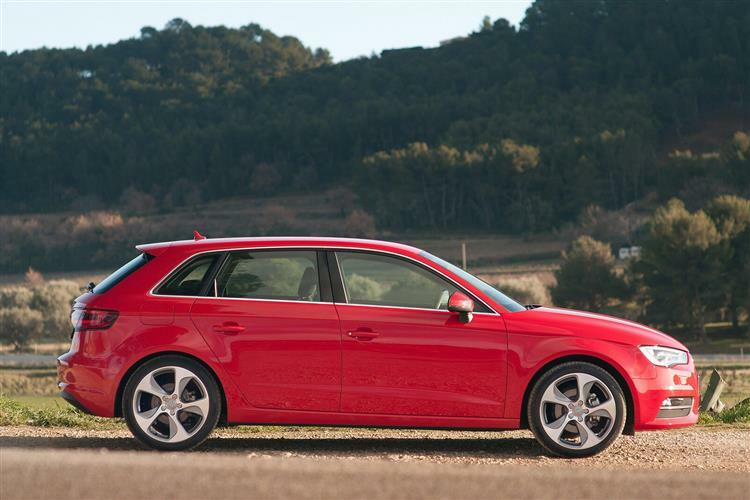 Audi though, has no such qualms and has always confidently pitched this car, the A3 Sportback, as the priciest of all the compact family hatches that the Volkswagen Group sells. There's a reason for this, just as there's a reason why Audi brand loyalty will see a huge proportion of buyers for this car being customers satisfied with previous versions. Explain to these people that the same technology could be theirs for several thousand less in a Skoda Octavia and you'll be met with looks of puzzlement wondering why such a fact could be relevant. There might be some smug satisfaction though, in their knowing that such a Sportback model would cost hardly any more than a comparable Volkswagen Golf. 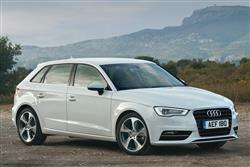 Though there was a five-door version of the original Audi A3, a bodystyle introduced to the range in 1996, the line-up only gained the 'Sportback' tag in second generation form in 2004 when five-door A3 motoring was repositioned for a slightly more mature, slightly more up-market audience. The third generation A3 range, launched in 2012, continued that trend, Audi's argument that this was more than just a three-door A3 with a couple of extra doors supported by this Sportback variant's longer wheelbase. The original version of this MK3 model A3 Sportback lasted until mid-2016, when it was replaced by an updated and lightly updated version. Here, we're going to check out the third generation car in its pre-facelifed form. As was Audi's intention, this five-door Sportback looks a little more mature and grown-up than its three-door counterpart in this MK3 model guise. And like that car, the detailing is beautifully done with a third rear side window added to the profile emphasising the wide, powerful C-pillar. Initial impressions that this car looks little different from its MK2 predecessor evaporate the closer you look at the taut, pretty bodywork. It's all built around what Audi calls a 'tornado line' that visually presses the car down onto the road, this a sharply drawn crease beginning at the headlights and extending in a curve over the wings, doors and side panels to the tail lamps. More important though, is what you can't see, the hi-tech MQB modular transverse platform that underpins the ultra-lightweight construction responsible for a weight saving of up to 80kgs over the previous design. That's equivalent to losing the weight of a fully grown adult, with benefits you can readily imagine in terms of performance and efficiency. And all of this despite the fact that this is a bigger vehicle than its predecessor - or at least it is inside. The length, width and height of this Sportback are actually pretty much the same as they were in its direct predecessor, but a 58mm wheelbase increase means that it'll feel usefully larger in the cabin Something you notice most when you're trying to load the thing with luggage. The 35mm increase in wheelbase that this Sportback enjoys over its three-door counterpart is responsible for a luggage capacity that rises from 365 to 380-litres. The cargo floor is flat and the opening between the wheel arches measures fully 100cms, so you might well find yourself being able to fit in more than expected. You've certainly a more versatile trunk space than the previous generation version of this car could offer, thanks to a neat floor that can be re-positioned at different levels, depending on the height of the load you have to carry. There's also a space beneath the cargo area for smaller items and extra functionality promised by useful options like a load area organiser (to separate your eggs from your Iron Bru), a ski hatch and a reversible load mat with a tougher side for boots and muddy dogs. Plus of course, as usual, you can push forward the split-folding rear bench for extra capacity - in the case of this Sportback, as much as 1,220-litres, 120-litres more than can be offered by the three-door. 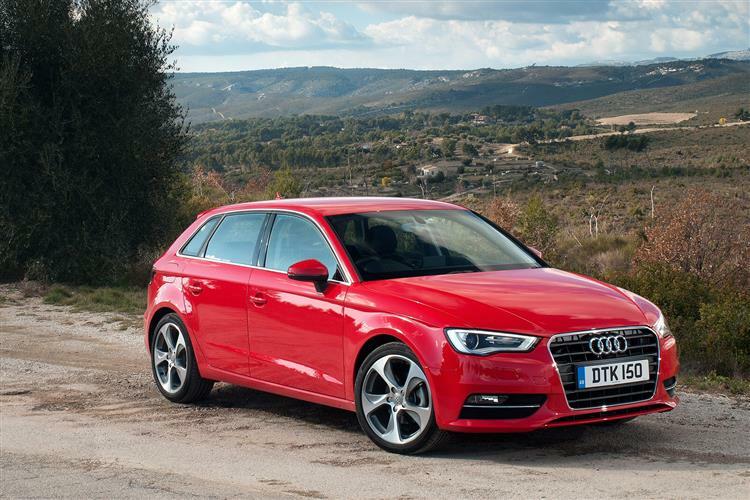 As for rear seat passenger space, well that wheelbase increase means that this Sportback is certainly the A3 variant to choose if you'll regularly be using the back seat. Even a six-footer sat behind an equally lanky driver will have plenty of leg and headroom. This rear bench can just about seat three adults but, as is inevitably the case with this class of car, two will be much more comfortable. What's certainly not in doubt is that there's a little more room here than there was before, especially with regard to headroom. What sets this car apart though isn't its practicality. No, it's the feeling you get from sitting behind the wheel. Quite simply, nothing else at the same kind of price point can match it, the cabin dominated by an electrically-extending 5.8-inch colour screen centrally positioned on top of the dash. Via this, you can marshal the many functions of a clever MMI infotainment system that prevents all but the most vital controls from cluttering up the minimalist dashboard. Just as distinctive are the four air vents, styled to look like miniature jet engines and made up of no fewer than thirty individual parts including bright metal outer rings that are shaped for perfect grip. Otherwise, you've an interior that'll be familiar fare to anybody who speaks fluent Audi design language, everything clear, classy and easily accessible. The instrument panel's styled in a wing-like profile and an electric parking brake switch replaces the traditional - and preferable - handbrake lever so as to free up space for the MMI infotainment system controller by your left hand. Ultimately, what it all adds up to is a cabin that wouldn't be out of place on a car costing twice the price. And how many models of this kind can you say that about? Exactly. 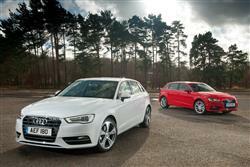 Despite the touch of extra weight, this Sportback A3 feels no different to drive than its three-door counterpart. Which means of course that it feels very good indeed. This MK3 model's MQB (or Modular Transverse Matrix) underpinnings were developed on a billion euro budget to deliver class-leading standards of ride, handling and a whole lot more. First up, because a lot of the stuff you can't see is lighter than it was in the old MK2 design, the car immediately feels more lithe and agile than you might expect, even on a short drive. True, real driving enthusiasts will still prefer the rear wheel drive reactions of a BMW 1 Series or the fine front-driven tactility of a Ford Focus. But everyone else will probably enjoy this Audi just as much thanks to lovely technical touches like the way that an electronic limited slip differential is built into the stability control system so that the car turns more sharply into bends. And the beautifully calibrated multi-link suspension that enables the car to flow fluently though those corners while nonchantly soaking up the bumps in a way that perfectly complements this Audi's quite exemplary standards of refinement. Suspension in fact, is one thing it's important to get right when seeking out this car. Sportier variants get lowered set-ups that we'd council most people to avoid. If you're fortunate enough to find a car whose original owner optioned it up with Audi's extra cost 'magnetic ride system' with its clever adaptive dampers, you'll have done yourself a favour because this set-up's well worth having. Wise winter drivers will also consider the merits of A3 variants that were fitted out with quattro 4WD, something that'll certainly pay dividends in wet or icy conditions. You may though, be quite happy simply playing with the neat 'drive select' vehicle dynamics system, a set-up that was fitted as standard to all but entry-level variants. Via 'comfort', 'auto', 'dynamic', 'efficiency' or 'individual' modes, it lets you vary the throttle response, steering weighting and, where the S tronic dual clutch sequential transmission is present, the gearbox shift points to create exactly the kind of feel you're looking for. You'll find this auto 'box fitted to the180PS 1.8TFSI petrol model and it's a rather good one, a dual-clutch system able to select the next gear before you've even left the last one. Most other A3s though, came fitted with the reasonably slick-shifting manual six-speeder. The auto option on the 1.8 certainly doesn't restrict its performance, rest to sixty-two mph occupying a fleet 7.2s on the way to 144mph. For those needing more, the 300PS turbocharged S3 hot hatch variant beckons, with its 2.0-litre TFSI turbo engine able to power you to sixty in just 5.1s. There was even a Plug-in hybrid e-tron version too. But these are minority choices. Almost all British A3 buyers choose either a 1.4-litre petrol variant or one of the diesels. Before talking TDI though, we need to point out that a pretty hefty slug of diesel frugality can be achieved more cheaply from the green pump courtesy of Audi's clever CoD, or 'Cylinder on Demand' technology. 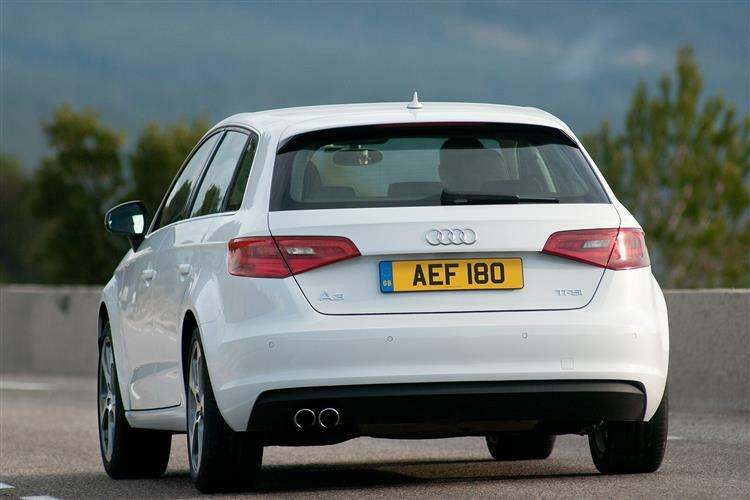 Audi used this in the pokier of the two 1.4-litre petrol TFSI models, that with 140PS, and it's capable of seamlessly shutting down two of the four cylinders at low-to-medium engine speeds. The result is a combined cycle fuel figure of nearly 60mpg that belies the spirited performance, a combination of virtues that's difficult to argue with. The lower powered 122PS 1.4 TFSI model gets none of this cleverness but still manages to stack up reasonably well on the balance sheet, as does the entry-level 105PS 1.2-litre petrol variant that's probably an even better alternative. As for the TDI diesel derivatives that over 70% of British buyers choose, well, there are two main ones: a 105PS 1.6 that makes sixty two mph from rest in 10.7s on the way to 121mph. And an altogether more satisfying 150PS 2.0-litre TDI unit that improves those figures to 8.6s and 134mph while remaining almost as clean and frugal. Should the basic 2.0-litre diesel engine's performance be insufficient, then you can try and seek out one of the higher-powered 184PS variants. 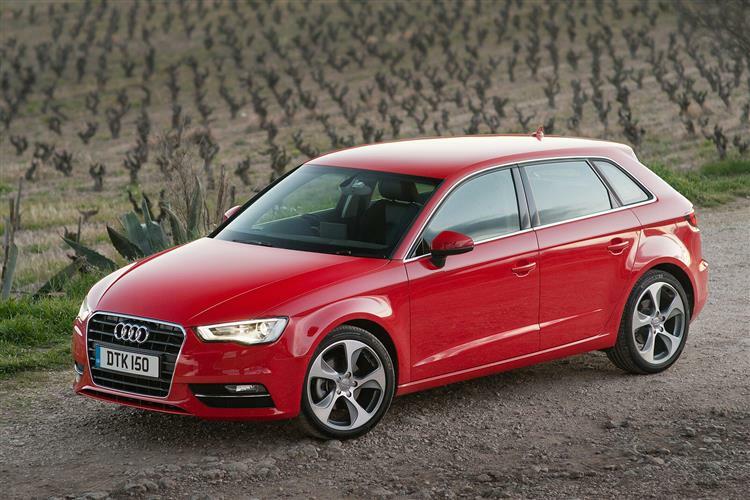 The Audi A3 was the model that invented the premium compact sector way back in 1996 and since then, almost all the cars sold in this segment have had five doors. Vital then, that this important Ingolstadt model should be at its most desirable in this form. It is. Indeed, 'why wouldn't you?' is the phrase that comes most readily to mind in consideration of this car. 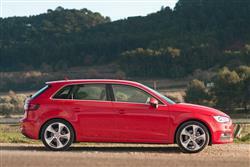 An A3 isn't cheap and you'll get so much more out of it in Sportback guise. It helps of course that in MK2 model guise, Audi gave this model the extra wheelbase - and therefore the extra length and space - really needed to suit its pricetag, market positioning and intended use. It's just enough to make this more versatile bodystyle a usefully more practical proposition than its three-door stablemate. Like the three-door variant, it's light in bulk, heavy in technology and as at home in Belgravia as it is in Brixton. And, as with that model, the interior is where this design really strides apart. You could be in a luxury car. 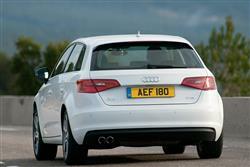 You certainly wouldn't think you were in a run-of-the-mill Focus-sized family hatchback. For not a huge amount more than you'd pay for one of those, this car brings a touch of class to the compact used car segment. Which of course is why so many people want one.